What! Yeah, you heard it right, ACCORDIONS ARE COOL! That's the message from this great Zydeco flavored group, The Crawdaddies. Most think of wedding bands when the squeezebox comes to mind, but it's the good times of New Orleans that pack this album. Surefire favorites are the spicy "Jabali" and "Shake and Bake". This Crawdaddies collection is all original, all rhythm and ALL GOOD. 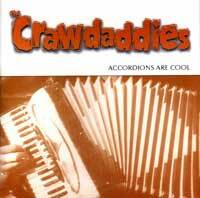 The Crawdaddies prove that you can make danceable, energetic accordion heavy music, that's not Polka! The tunes, "Becky's Brewin" and "Big Woman, Short Skirt" are fun and rambunctious examples of what the band is all about. You'd think this Cajun/Zydeco group is from New Orleans or Baton Rouge... but you'd be wrong... The Crawdaddies hail from Baltimore, MD. The members of this group are great musicians, and you'll know this by the music they make. They are a unique and talented band, with a deep and rich musical experience. Their style has been called, Zydeco-Swing, Rock N' Soul, it is high energy, and all CRAWDADDIES. Yes, ACCORDIONS ARE COOL. You'll love it.